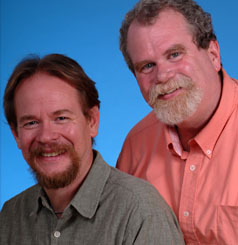 Both Hoerl ( left ) and Scott are active theater professionals in Chicago, with long ties to the gay community. They have been together since Nov. 1, 1980. Hoerl is an Actor-Director/ Adjunct Professor of Acting CCPA at Roosevelt University/ Director of Meisner Training Act One Studio. In the 1980s he owned Opal Station, a popular gay entertainment bar. Scott is Associate Producer at the Goodman Theatre, a Theatre Director, Adjunct Professor at the Chicago College of Performing Arts at Roosevelt University, and a Master AActing Teacher at Act One Studio.